Thousands of students have marched through London to protest against the rising costs of university and further education. 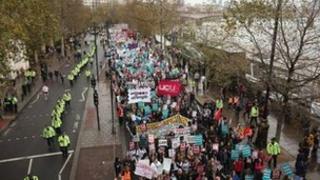 It was the first national student protest since a wave of unrest over tuition fees two years ago. The demonstration was organised by the National Union of Students (NUS), with support from other groups. There was a small stand-off between protesters and police at Westminster. But the protest passed off peacefully, ending with a rally in Kennington. The NUS says about 10,000 people took part in their "Demo 2012", while the Metropolitan Police said it would not make an official estimate of numbers. The NUS published a survey to coincide with the protest which it said suggested voters had not forgiven Lib Dem MPs over the raising of tuition fees. "Education should open doors, but the government is slamming them shut," said NUS leader, Liam Burns. "The damaging effects of recent changes to education have restricted access for future students and created new barriers for those currently studying," he said. The protest march was an attempt to put students back on to the political agenda, raising concerns over the impact of higher fees and the loss of financial support such as the education maintenance allowance. Students and other protesters also highlighted concerns about the lack of job opportunities for young people. The demonstration marked the second anniversary of a protest against tuition fees in November 2010, which drew 50,000 students and saw a violent attack on Conservative Party offices in Millbank. The student march made plenty of noise as it moved slowly through central London in the cold and rain. The only flashpoint came as the crowd surged close to police lines blocking the way into Parliament Square. There was a brief stand-off, but nothing like the violence and running battles that characterised the tuition fee protests of two years ago. But some things had stayed the same. Nick Clegg was still not winning any student popularity polls. Tuition fees remain a provocative issue. The NUS leadership still faces internal divisions. And students still like their placard slogans, including the cryptic: "Down With This Sort of Thing." The students will feel they made their point - claiming a respectable turn-out of 10,000 people, drawing attention to higher fees and tougher graduate job prospects. And the police will feel that their low-key approach was successful. But in the end any attempt to take the temperature of mainstream student opinion was washed away in the driving rain of south London. A series of subsequent demonstrations saw clashes with police. Earlier, BBC education correspondent Sean Coughlan said it had been a "noisy but good humoured march...with whistles and chants mixing with the sound of helicopters circling above". "There's a stand off outside Parliament, against police lines that are closing off Parliament Square," he said at 13.34 GMT. "Most of the march has moved over Westminster Bridge, but perhaps a few hundred are pressing up against police lines, waving banners and shouting". But that protest faded away and the remaining demonstrators headed south to the rally in Kennington Park, with numbers thinning in bad weather. There, NUS president Liam Burns was heckled by some of the crowd and pelted with eggs as he made his speech. Protesters who had accused the NUS leadership of being too moderate then invaded the stage. The National Union of Students says tuition fees will still be an issue in the next election - and it published a YouGov survey indicating it will influence the voting of parents with children affected by higher fees. The Liberal Democrats and their leader, Nick Clegg, who promised to vote against raising tuition fees, became particular targets for student anger. And the survey of 2,025 adults indicates 58% of those with children under the age of 18 believe that MPs who broke their promise over tuition fees should not stand at the next election. It found 62% of these parents said they would not vote for an MP who had broken their election pledge on fees. "Nick Clegg won the trust and votes of young people and their parents by signing the pledge, but has now lost them once and for all by breaking it," said Mr Burns. The demonstration by the NUS passed through central London from the Embankment before heading south of the river at Westminster. It was joined by protesters from the more radical National Campaign Against Fees and Cuts. Michael Chessum, from the group, said the demonstration was about a "failure of the political system". "We are calling for education funded by taxing the rich and big business," he said. A spokeswoman for the Department for Business, Skills and Innovation said the government's reforms had made the university system "fairer and more progressive". "Most students will not pay up-front to study, there are more generous loans, grants and bursaries for those poorer families and loans are only repaid once graduates have jobs and are earning over £21,000," she said. "Students, like other citizens, have the right to participate in peaceful protest."